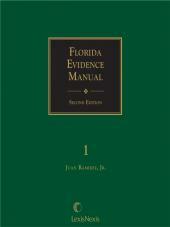 Florida Evidence Manual has been the mainstay of active Florida attorneys for more than two decades. 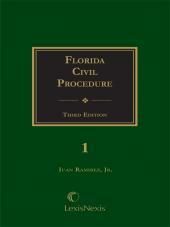 Originally compiled and maintained by Professor Kenneth B. Hughes, it has been completely revised and updated by his successor author, the Honorable Jose Rodriguez, Florida Third District Court of Appeal. 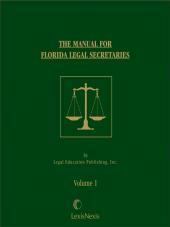 Whether you are a seasoned attorney or new to the Bar, you are bound to find in Florida Evidence Manual the kind of practical advice that will enhance your effectiveness in the courtroom. 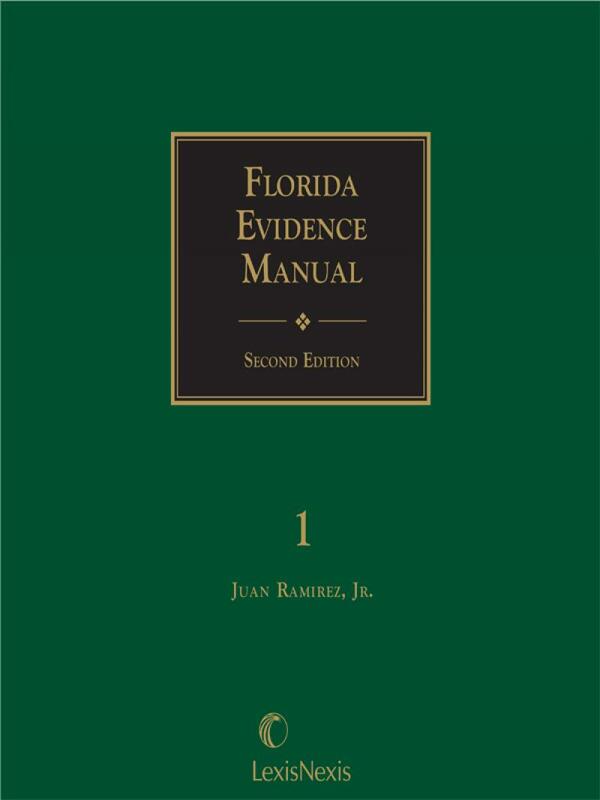 To ensure that busy attorneys can find the relevant material they need quickly and easily, Judge Rodriguez updates the Florida Evidence Manual to follow the sequence of the Florida Evidence Code. 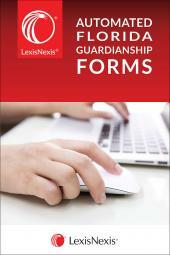 He cites the text of each code section in full, and analyzes applicable state and federal cases, scholarly treatises, and law review articles that discuss and interpret the section. Look up a topic in the Florida Evidence Manual, and get everything you need at your fingertips. The Honorable Jose M. Rodriguez graduated from Florida International University with a Bachelor of Arts degree in 1978, and then went on to graduate from Indiana University School of Law with a Doctor of Jurisprudence degree in 1980. Following law school, he became a trial lawyer and litigated for fourteen years, prior to his appointment to the bench. Judge Rodriguez was appointed to the position of Circuit Judge of the 11th Judicial Circuit of Florida by Governor Jeb Bush in May of 2000 where he was assigned to the criminal division, and later assigned to the civil division and Family division. He is presently assigned to the Complex Business Ligation division. Prior to his appointment to the Circuit Court, Judge Rodriguez was appointed by Governor Chiles to the County Court in January 1994 and served as County Judge for six years where he also served as Associate Administrative Judge in the criminal division. Judge Rodriguez was twice nominated in 2011-2012 by the 3rd District Court of Appeal Judicial Nominating Committee for Judicial Appointment and was twice considered by Florida Governor Rick Scott for Judicial appointment to the 3rd District Court of Appeal. Judge Rodriguez has been an active member of numerous Judicial committees of the State of Florida Supreme Court, most notably the Florida Supreme Court Judicial Ethics Advisory Committee, the Florida Supreme Court Mediators Qualifications Committee and the Florida Supreme Court Judicial Mentor Program, among others. He is also an active member of the Dade County Bar Association, Cuban American Bar Association, and other professional associations. In addition to participating in Judicial committees and professional associations, Judge Rodriguez has dedicated much of his time to Florida’s academic community. Judge Rodriguez has had a long and continued association with Florida International University as an Adjunct Professor in University College at the Legal Studies Institute since 1994, where he teaches the courses of Introduction to the U.S. Legal System, Torts, Constitutional law and the Online Course Module of Introduction to The Legal System, Legal Writing, Legal Research, Criminal Law, Evidence, Real Property, Trust and Estates, Contracts, Business Organizations and Civil Procedure. He is former Adjunct Professor in the College of Health and Urban Affairs, School of Policy and Management in the Criminal Justice Department. He also is an Adjunct Professor at the FIU College of Law and teaches Florida Civil Practice. Judge Rodriguez is a current member of the Florida International College of Law Advisory Board, the Legal Studies Institute Advisory Board, and the Academy of Arts and Teaching Adjunct Professor certification program, among others. Judge Rodriguez has also served the Florida Judiciary as a faculty instructor at the Florida College of Circuit Judges in 2000 and 2004. He has participated, as a presenter in a program on ethics and professionalism for Judicial candidates of the 11th, 16th and 19th Judicial Circuits as a member of the Judicial Ethics Advisory Committee in 2000 through 2012.